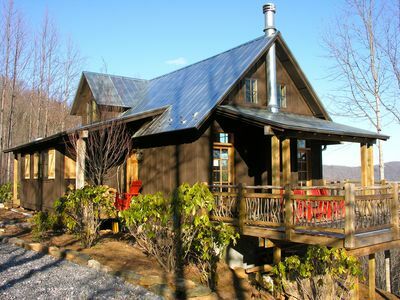 Winter Star Retreat is a remote, rustic cabin located high in the Black Mountain Range of western North Carolina. 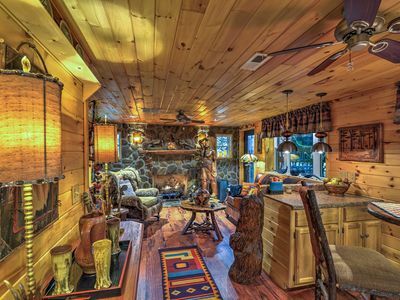 The cabin offers a unique, relaxing experience for our guests. NOTE; CHILDREN MUST BE AT LEAST 10 YEARS OF AGE. 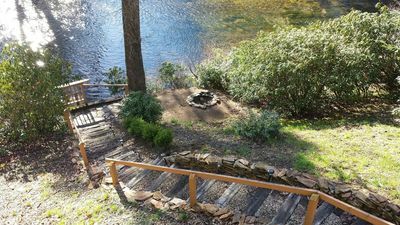 Winter Star Retreat is located on Winter Star Creek in the Cattail Creek Community of Yancey County. 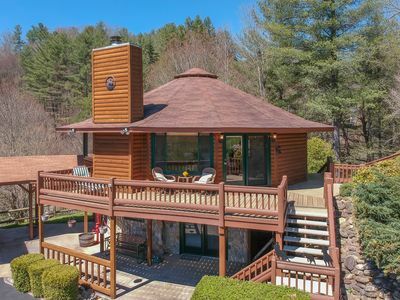 We are less than an hour from Asheville NC and about 30 minutes from Burnsville, the county seat of Yancey County. 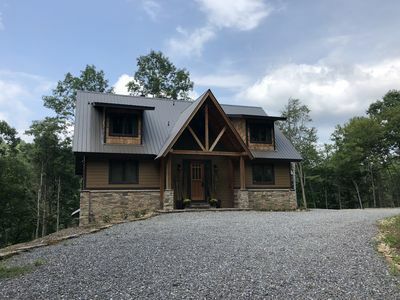 The cabin is at 4200 foot elevation on the west side of the Black Mountain Range, the tallest mountain range east of the Mississippi. It is nestled beside a fast flowing creek that splashes over boulders and through rock pools surrounded by rhododendrons. 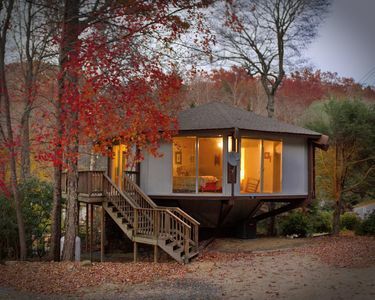 The cabin is set in a lovely hardwood forest just outside the Pisgah National Forest. 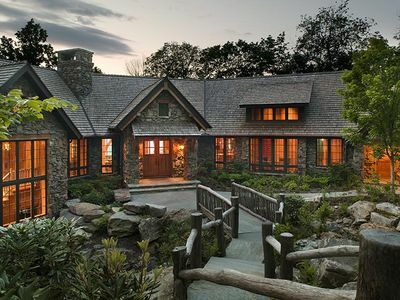 The setting is very private and quiet. The only noises you’ll hear are the birds and the creek- which will lull you to sleep each evening! The cabin has three lovely bedrooms. Two have queen-sized beds and the third has a pair of twin beds. Maximum of six guests please. Two full baths are provided. One, with shower, is en-suite with one of the bedrooms. 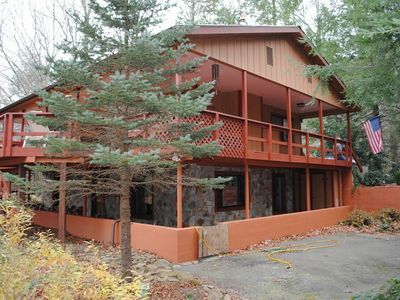 Excellent hiking and mountain biking trails begin at the cabin’s doorstep. The trails follow the old logging railroad right-of-way which was used in the early 1900’s. A popular half day hike takes you to the 100 year old Isom Mica Mine. This can be extended to a full day loop hike that ascends to 5600 feet. 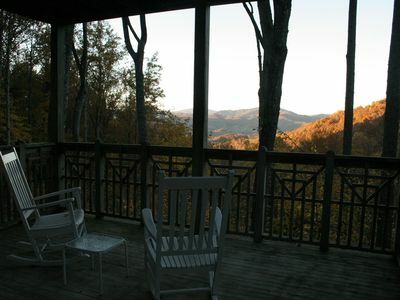 Both hikes provide spectacular views of the Black Mountains and upper Cane River valley. 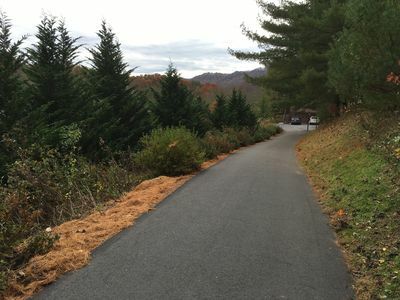 Other trails connect to the Black Mountain Crest Trail on the top of the range and to Mount Mitchell, at 6684 feet the highest peak east of the Mississippi. 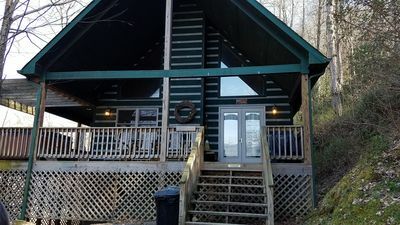 Fly fishing (with NC permit) is just minutes from the cabin as are kayaking, tubing, and rafting on the Nolichucky River (in season). 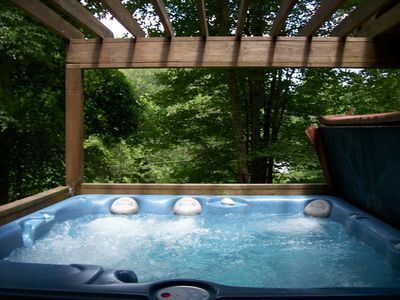 But best of all, just relax on the spacious deck next to the creek in the hot tub and enjoy the peace and solitude! NOTE: Winter Star Retreat is an older rustic cabin. The ceilings in some of the rooms are only 6 feet 5 inches high- so if you are over 6 foot 4 this may not be the place for you! Maximum number of guests is six. Children must be at least 10 years of age. 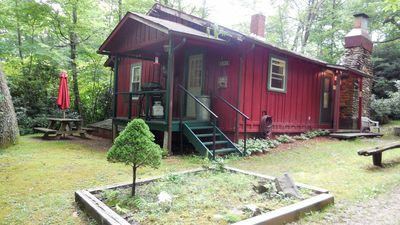 The cabin is located on a rough gravel road. The road is not suitable for low ground clearance vehicles such as sports cars. Normal sedans, large and small SUV's, etc. normally will not have any problems negotiating the road. Contact us if you have any concerns. 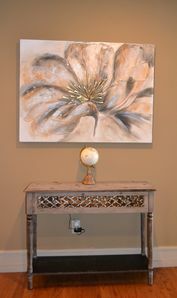 Even at our remote location we have high-speed Internet available for our guests. We also have limited cable TV. A video monitor and DVD/VCR player are provided so bring your favorite movies! Local and long-distance phone service (to the lower 48 states) is provided free of charge. Enjoy the opportunity to really unwind without distractions! Children must be at least 10 years of age. Explore the nearby Blue Ridge Parkway for breathtaking views! Visit Mt. 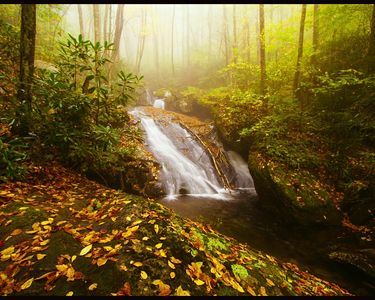 Mitchell State Park to enjoy the 360-degree view that can extend to the Smoky Mountains. Take a short hike and enjoy lunch at the Park's Restaurant (restaurant open May through October). Visit the famous Biltmore House and Estate, a bit more than an hour away. BEST RIVER BEACH ACCESS IN COUNTY! 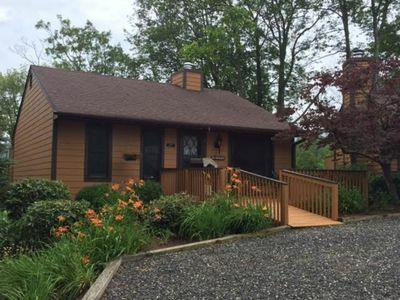 BEACH AREA, DECKS, FISHING, TUBING, FIRE-PIT. 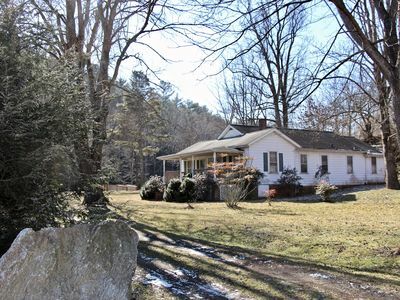 250 Acres off Blue Ridge Pkwy - "Red House"
NC Trout Fishing, Kayaking and Tubing on the South Toe River! Pet Friendly! 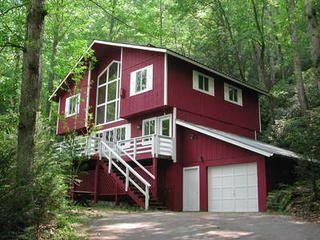 Dogwood Cabin, on the River, Family fun or quiet Retreat. 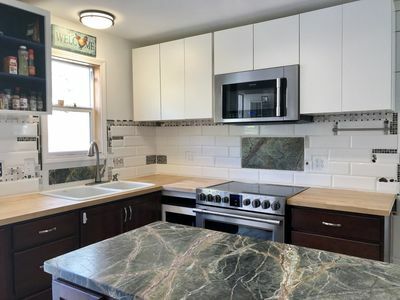 Looking for a great place? Fantastic Mountain View’s? 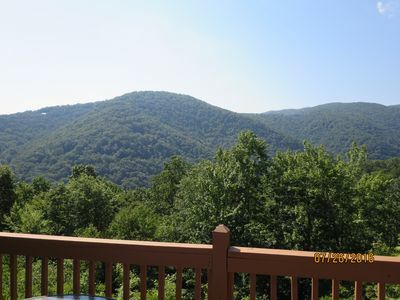 Fantastic Mountain Condo in Burnsville, NC with great views and a luxurious feel! 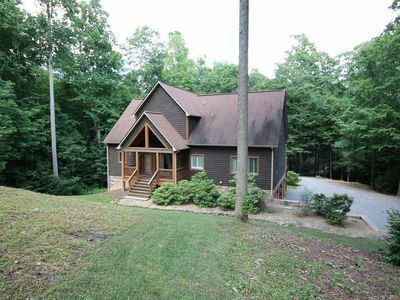 Gorgeous four bedroom 4 bathroom mountain cabin. Easy access, wood-burning FP.